"View our Online Demo Tutorial to see how VoiceGear Works"
Click on the image on the right to launch our online demo tutorial. 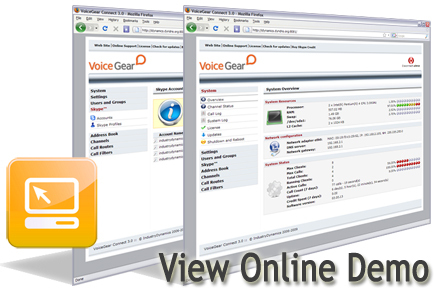 You can also try VoiceGear Skype gateway software on our live demo server. If you would like to deploy VoiceGear in your own environment, you can download and install VoiceGear Skype gateway software absolutely for free! See How it Works Before You Buy! Try VoiceGear software for yourself on our live demo server. Download and install VoiceGear Skype gateway software. Like it? Purchase VoiceGear software license.